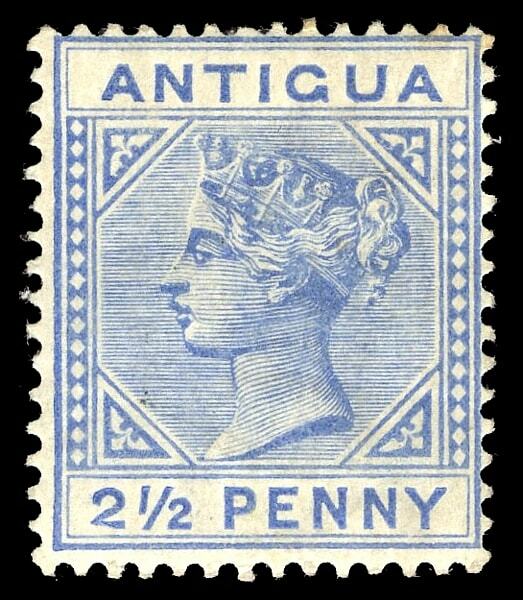 1887 QV 2½d ultramarine. 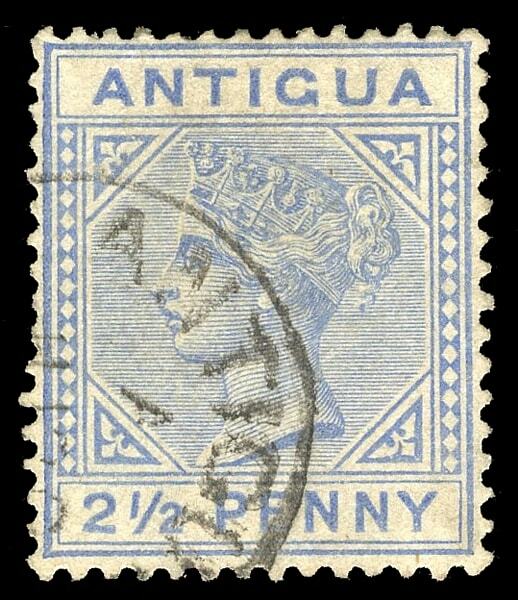 A fine mint copy showing the LARGE "2" in "2½" WITH SLANTING FOOT variety. 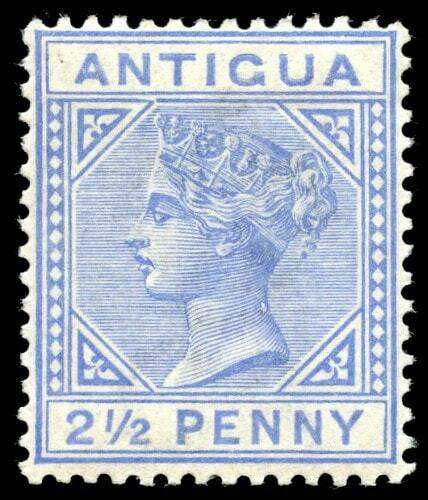 Row 3/1 of the duty plate found on the early printings of SG 27 and shows "NN" of "PENNY" undamaged. Gibbons Type C for this variety. Does not show any BREAK IN "2". Couple of toned perf tips. SG 27a. 1887 QV 2½d ultramarine. A fine used copy showing the Row 9/6 "2" WITH SLOPING FOOT variety. This should not be confused with the slanting foot flaw variety. Ex Manning. SG 27a var. 1887 QV 2½d ultramarine. An u/m never hinged copy showing the TOP LEFT TRIANGLE DETACHED variety. Row 2/3 right pane. SG 27b. 1884-87 QV complete set of three very fine mint overprinted "SPECIMEN". Samuel Type D12. SG 27s,28s,30s. 1887 QV 4d chestnut. 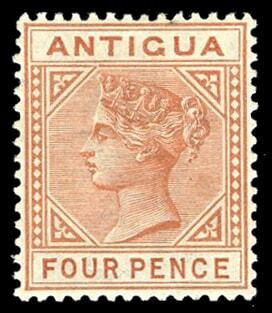 A very fine mint copy showing the TOP LEFT TRIANGLE DETACHED variety. Row 3/3 Plate 2 right pane. SG 28a. 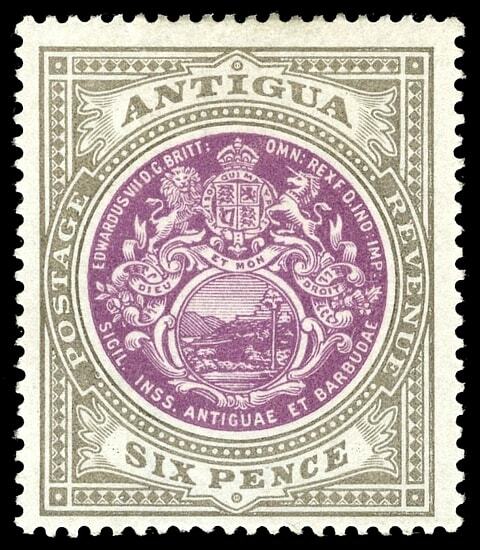 1903-07 6d purple & drab. A very fine mint copy with WATERMARK INVERTED. SG 36w. 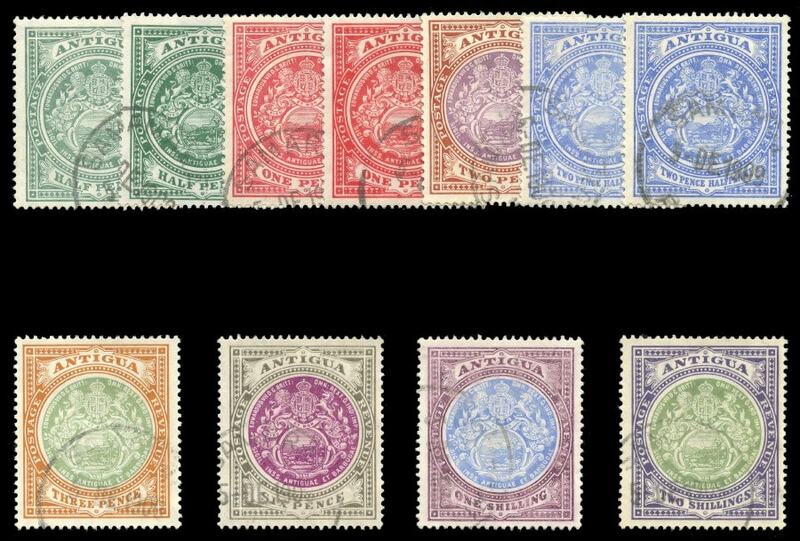 1908-17 "Arms" issue complete set including all listed shades all very fine mint. Eleven stamps in total. SG 41-50. 1917 ½d. Two very fine mint copies in contrasting shades, one blue-green and the other dark green. Listed in our Five Reigns catalogue as BK E12 & BK E13. SG 42,42 var. 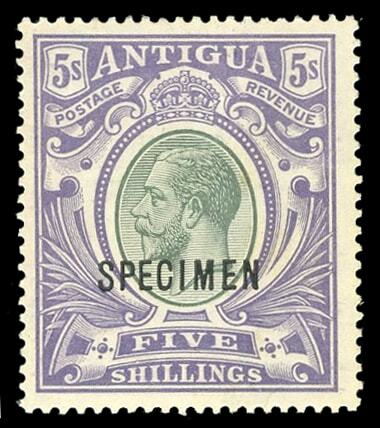 1913 KGV 5s grey-green & violet very fine mint overprinted SPECIMEN. Samuel Type D12a. SG 51s. 1922 KGV £1 purple & black/red. A very fine mint lower marginal Plate 1 copy. SG 61. 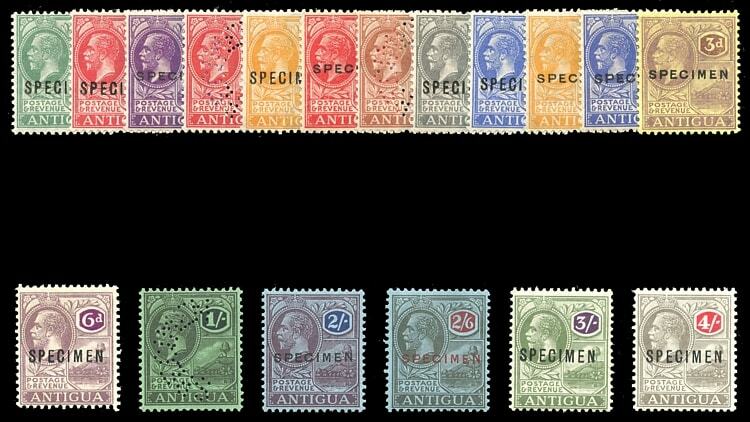 1921-29 KGV complete set of eighteen (Wmk Multi Script CA) very fine mint overprinted or perforated SPECIMEN. Samuel Type D12, D16, & D19. SG 62s-80s. 1948 KGV 2s6d black & red/blue tied to cover by a scarce "JOHNSONS POINT" cds dated SP 1 '48. Extremely late usage for this stamp. SG 78. 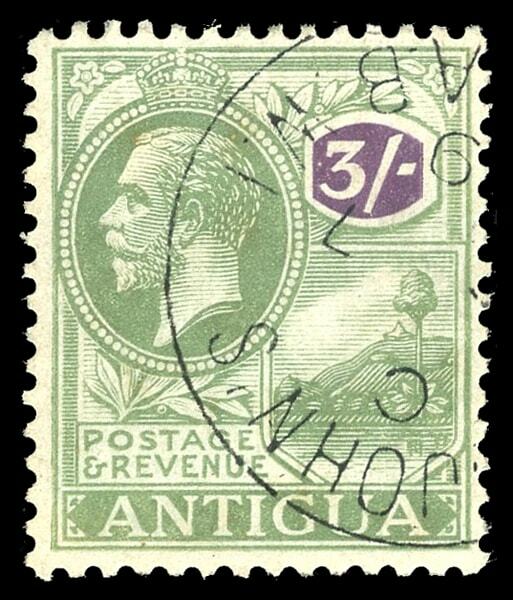 1921-29 KGV 3s green & violet. A very fine used copy cancelled with a MADAME JOSEPH forged cancel dated OC 7 '09 (Type 13). 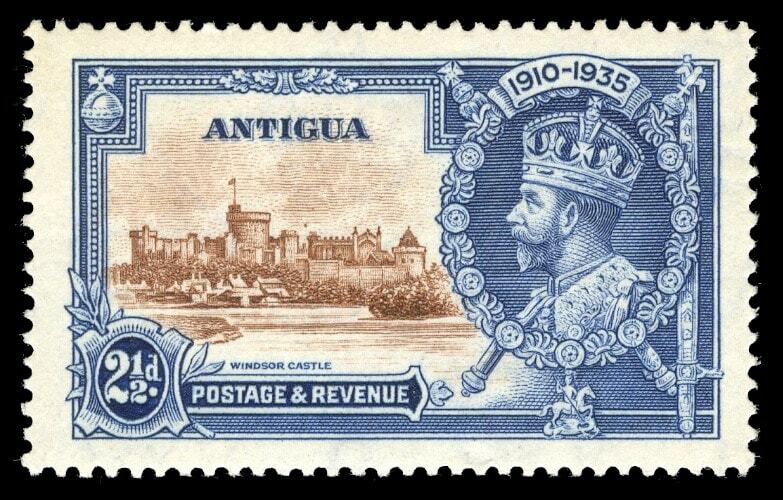 This stamp was only issued in 1922. SG 79. 1932 KGV 1s olive-green and 2s6d claret both very fine used, each cancelled with a MADAME JOSEPH forged postmark dated MY 18 1932 (Type 14). SG 88,89. 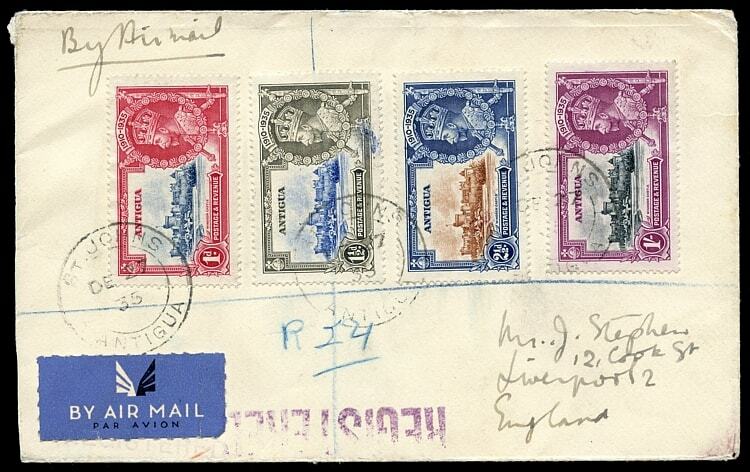 1935 KGV Silver Jubilee complete set of four (SG 91-94) on Registered cover to England via USA all tied by St Johns postmarks dated DE 27 `35. 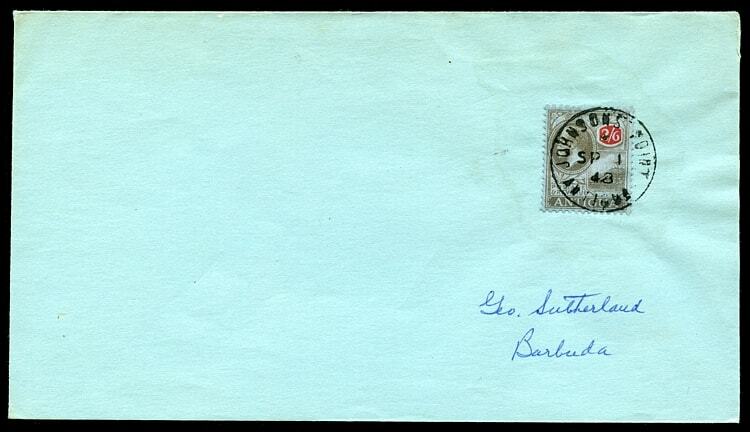 Reverse backstamped with two different New York stransit postmarks and a Liverpool receiver dated 10 JA '36. 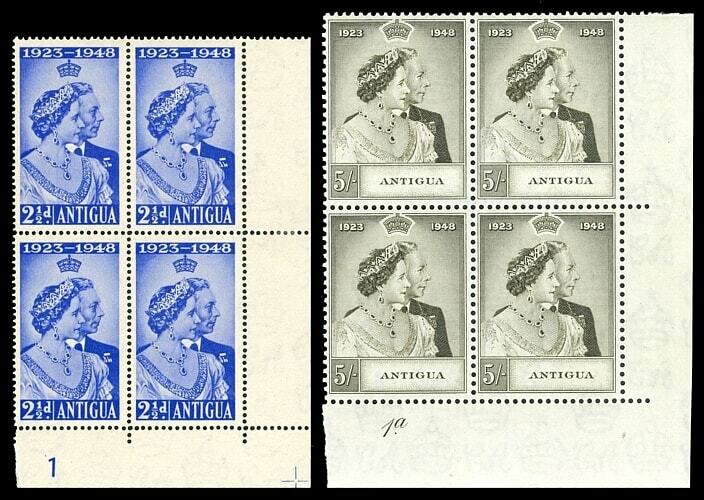 1935 KGV Silver Jubilee 2½d brown & deep blue. 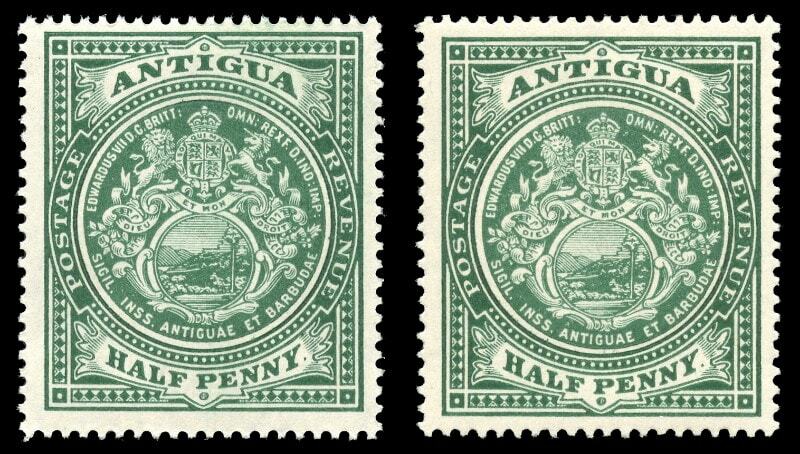 A very fine mint copy showing the DOT TO LEFT OF CHAPEL variety. Row 8/3 Plate 2B. SG 93g. 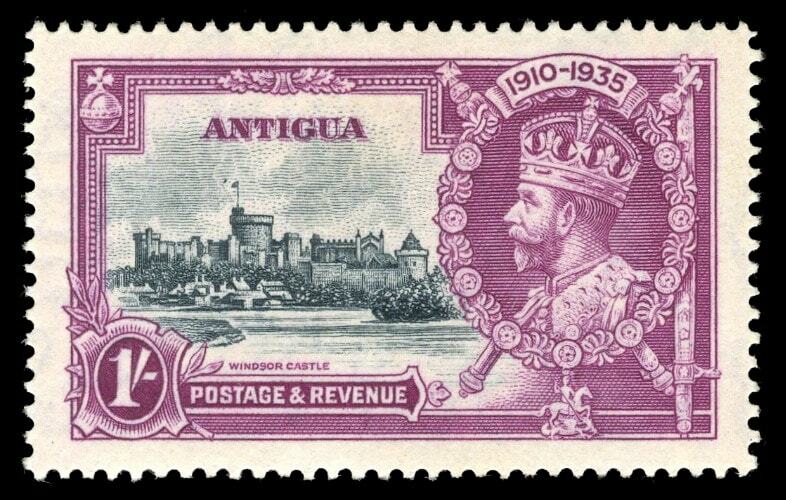 1935 KGV Silver Jubilee 1s slate & purple. 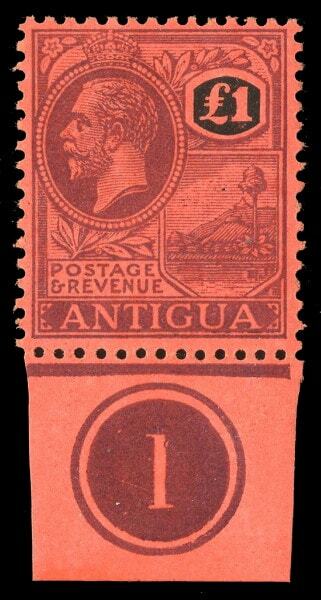 A very fine mint copy showing the DOT BY FLAGSTAFF variety. Row 8/4 Plate 4. SG 94h. 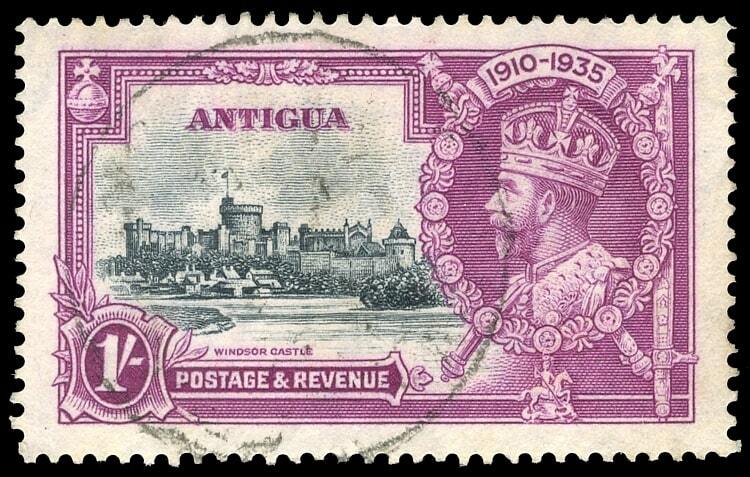 1935 KGV Silver Jubilee 1s slate & purple. A very fine used copy showing the DOT BY FLAGSTAFF variety. Row 8/4 Plate 4. SG 94h. 1946 KGVI Victory set of two very fine mint perforated SPECIMEN. Samuel Type D21. Certified as genuine. 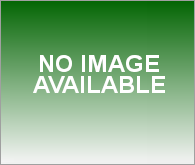 SG 110-111. 1949 KGVI Silver Wedding set of two in u/m never hinged SE corner Plate blocks of four. 2½d Plate 1 and 5s Plate 1a. Hinged in the margin only. SG 112-113.